There’s a lot of things I love about summer, but I think summer evenings are my favorite. You know the ones- the sun hasn’t gone down yet and though the warmth of the afternoon is still lingering, it has cooled considerably. The windows are open and a nice breeze flows through the house as you put the finishing touches on a light dinner. 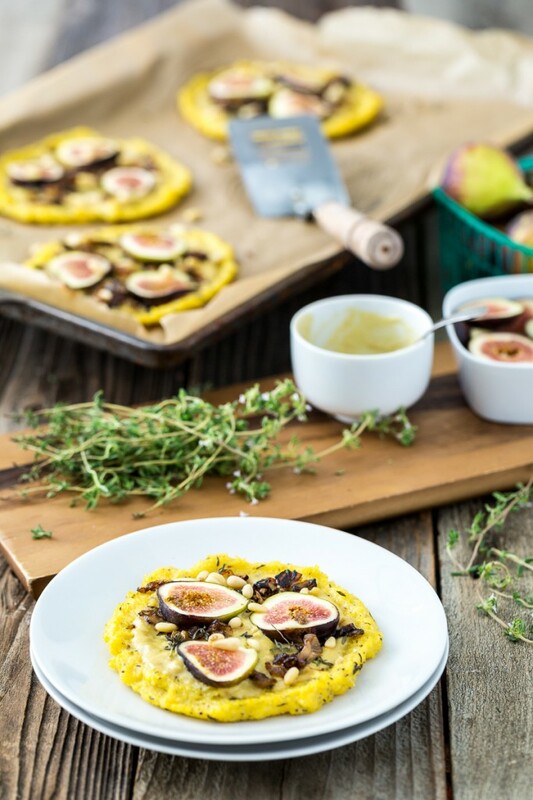 As you slice your figs to top mini polenta pizzas, you drop a fig on the floor. You quickly pick it up before the dog runs in and snatches it and as you do, you notice your toes still have sand caked to them from your walk on the beach this afternoon. Your significant other (or friend)(or cousin)(or daughter) turns on some music. At first it’s much too loud, but they quickly turn it down to a much more reasonable volume. Gladys Knight and the Pips always make for great background music. You take a sip from a glass of ice water (or wine)(or lemonade)(or beer) before you pour a simple lemon vinaigrette over your side salad. Before long, the pizzas are ready to come out of the oven. You use a spatula to serve up a couple mini pizzas for each person and let them add some salad to their plate before heading outside to the patio (or balcony)(or backyard)(or table and chairs located near an open window or door) for a peaceful meal. As you talk and laugh with your loved ones, the stars begin to come out of hiding. 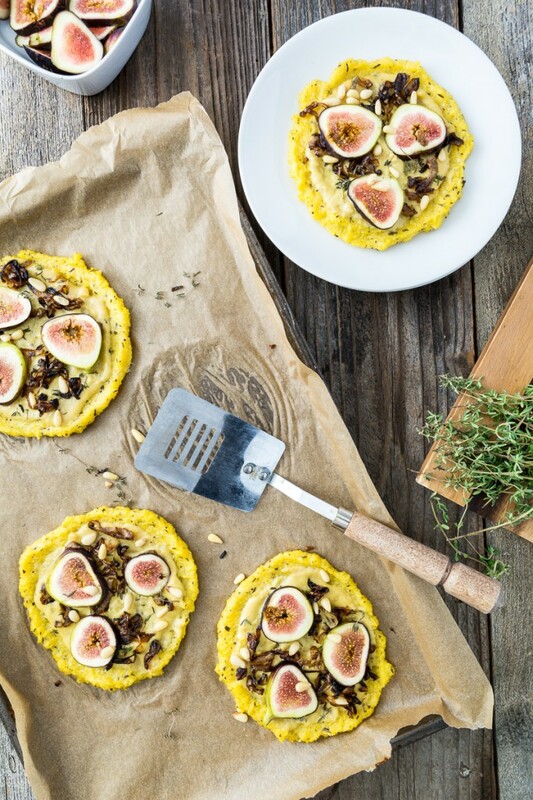 These mini polenta pizzas are so simple, yet so elegant and delectable and they make for a perfect dinner on lazy summer evenings. The base for the polenta crusts takes 15 minutes to prepare earlier in the day. If you aren’t in the mood for polenta, you could always prepare regular pizza dough instead. When you’re ready to start making dinner, pull the crusts out of the fridge and bake them while you caramelize the shallots and make your cheese sauce and sip on something refreshing. When they’re done baking, you just spread out the luscious cheese sauce and pile on the caramelized shallots. Add some sliced figs (because figs on pizza = sophisticated deliciousness), fresh thyme, and a few pine nuts before popping them back in the oven (and as a side note, we discovered after shooting these that Phoney Baloney’s coconut bacon makes a wonderful topping for these pizzas too). Minutes later, you’re using this time of year to your advantage and doing summer evenings totally right. 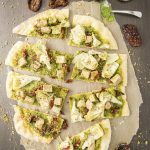 It was discovered after photographing these pizzas that sprinkling Phoney Baloney's coconut bacon on top, after baking, is a sure-fire way to take these pizzas up a notch. Thank you to everyone who entered the Bella Nut Butters Giveaway! The lucky winner is Lydia Greenfield! What’s your favorite way to spend summer evenings? 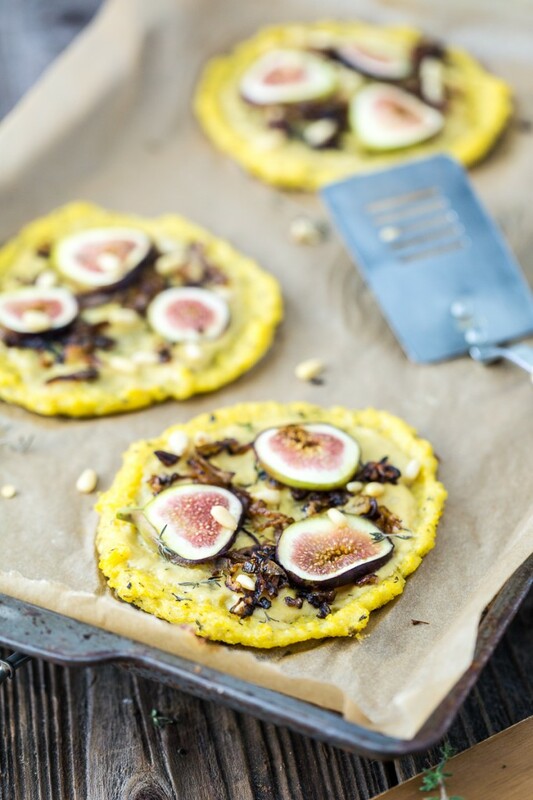 15 Responses to "Caramelized Shallot & Fig Polenta Pizzas with Thyme & Pine Nuts"
I loved the way you described your summer evenings cooking and eating dinner. It’s just like I remember when I was a kid. I was literally taken back 20 years ago. You’re truly an excellent writer! And the pizzas look amazing too! 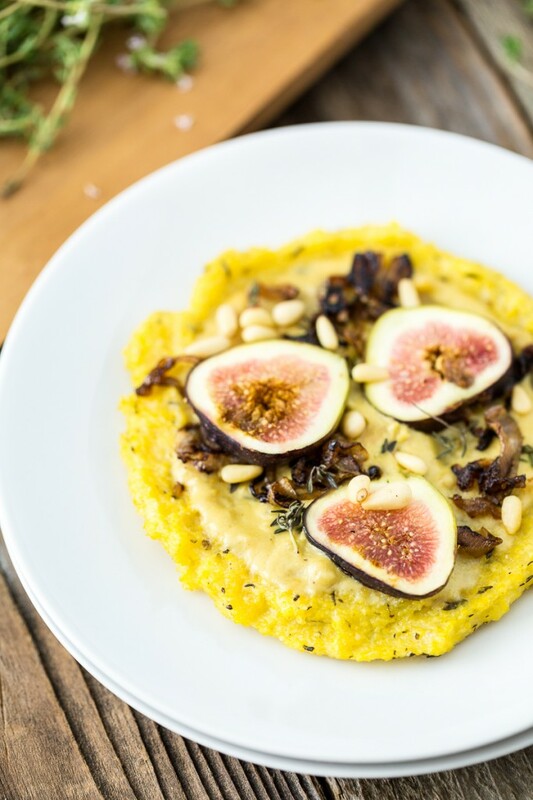 I definitely want to try out polenta as crust! What a great post. Beautiful descriptions, beautiful photos and beautiful food. but why couldn’t the dog have the fig? they aren’t poisonous to dogs are they? just wondering because mine loves her veggies and fruit so is always looking for drop offs. 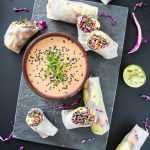 What a beautiful and delicious combination of flavors and ingredients – these are gorgeous! 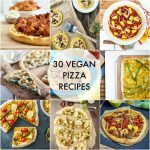 I love summer nights too- easy and relaxed, a little cooler than the day time, perfect for a glass of wine, food and friends 🙂 These pizzas look unreal! Lovely pizzas! 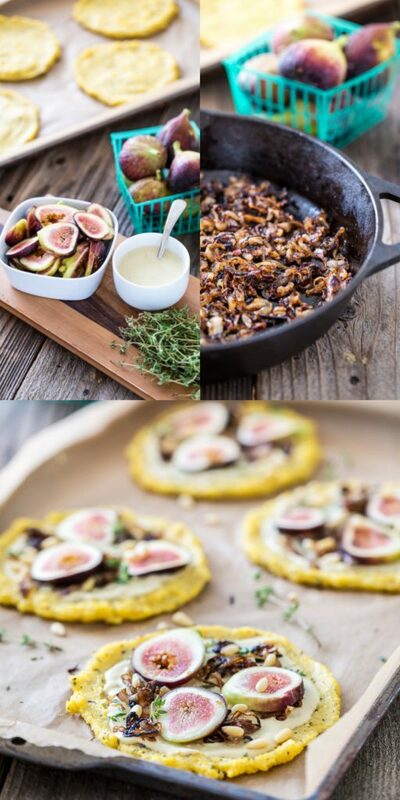 I need to get my hands on some fresh figs asap! These are absolutely beautiful. I can’t wait to try the flavor combination you came up with! Anything that looks this impressive but is actually pretty simple is my perfect recipe. Brilliant, thank you! Wow they look great, and I love to try different pizza bases. Roll on a sunny weekend! So many of my favorite foods in one place! 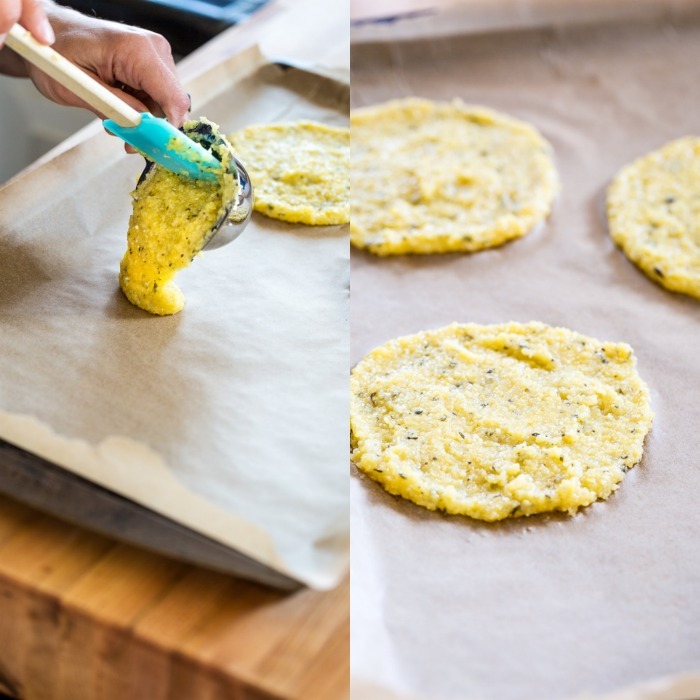 I’m a huge polenta fan, but I hadn’t thought about using it for pizza crusts. Such a good idea! I am counting the days until figs arrive here, but it will probably be a while, sadly. 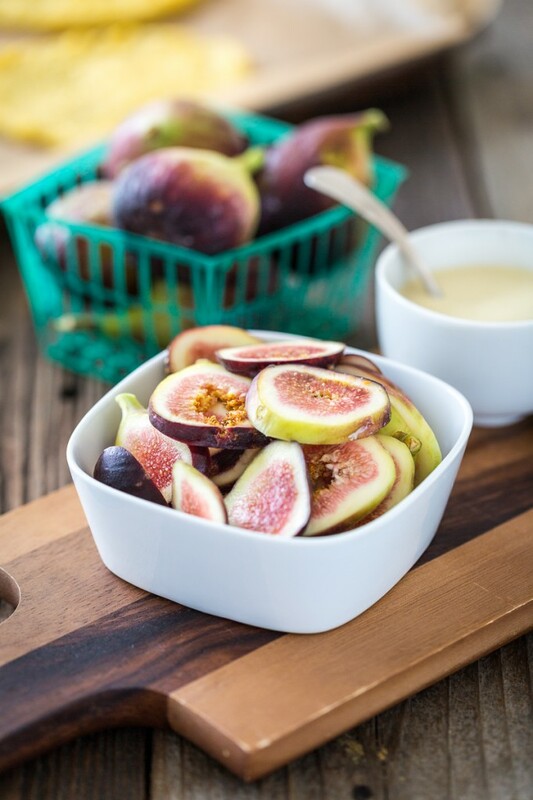 That is one thing I really miss about California – a longer fig season. You set the whole summer scene beautifully. I wish I was there sharing a polenta pizza with you! Cadry recently posted…A movie theatre with nutritional yeast and vegan burritos? Somebody pinch me. What a great take on a classic – pizza! 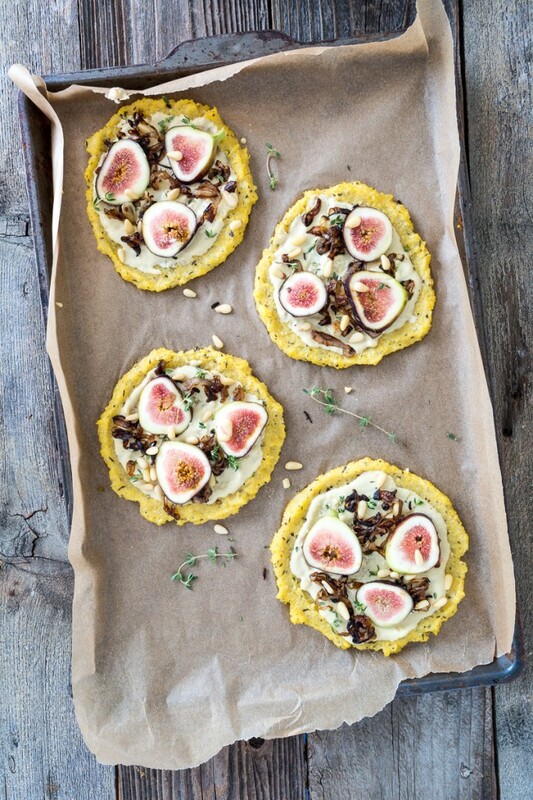 I love figs, and if the crust really only takes 15 minutes, I will need to try this one time. Y recently posted…mango vanilla pastry cups. Made this last night with some rainbow chard on the side. So delicious and so pretty! Thanks for the beautiful recipe! So beautiful and super easy! 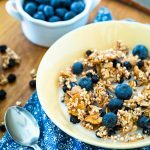 I’ll try this recipe as soon as possible! You can use water in place of the broth. Thanks! 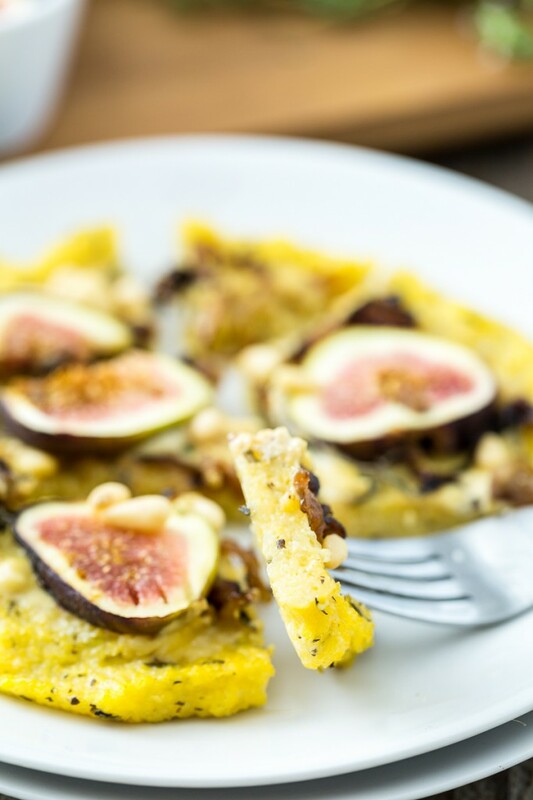 Could I stir up polenta cold and pour some into tart dishes, not deep, and just cook in oven? I do so much that way, arthritic and stirring so hard. (I do gd. Lentils and water, gd. Chickpeas and water, often over leftover veg. So would polenta work?